PLUG IN. TURN IT UP AND HIT THE ROAD. 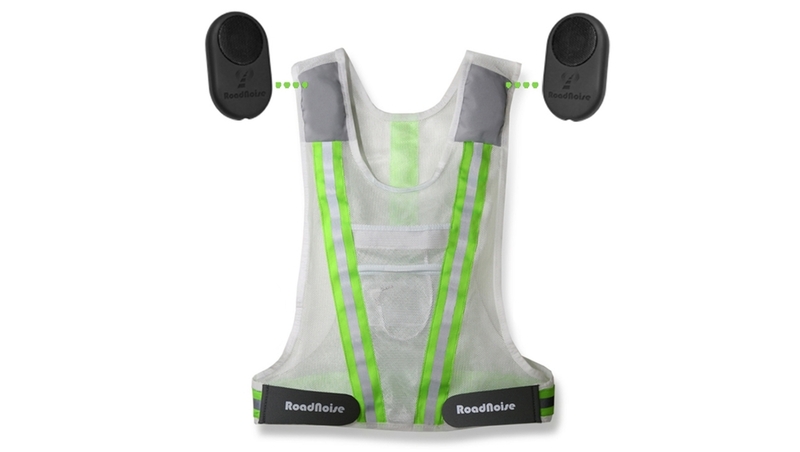 Roadnoise Sound Running Vest with built in speakers. Reflective safety vest. Holds any phone or MP3 player. Form fitting. Great for running, training, relays, walking, cycling. Have the sound you want without eliminating the sounds around you. ROADNOISE vests give you the ability to hear your footsteps, your breathing, and your surroundings along with your favorite music. There's nothing in your ears and no dangling cords to get in the way. Just plug in your divide and you're off running. A reflective vest with sound. PLUG IN. TURN IT UP. AND HIT THE ROAD. With speakers that sit below your ears, you'll have the music you want without blocking the sounds around you. With an amplifier/volume control that gives you great sound and ease of use with any music device or phone. The vest is very light weight and comfortable, without cords or anything in or around your ears. It holds the largest phones comfortably, as well as hydration and many other extras. We've met enough runners that love the vest, but don't listen to music while running, so we offer the Long Haul without the music. Same vest and features without the amp and speakers. You can get your Long Haul fully Loaded with a 1-liter reservoir and two Softflask bottles. Reservoir and Softflask bottles are also available separately. The ultimate overnight relay vest, designed as a solution to relay music regulations. No batteries. No dangling cords. Just plug in and go. Speakers are powered by your phone or music device. A two-pocket system in the front holds your smart phone or smaller music device, keys or ID. Available in Lime Green, Hot Pink and Black. 360º reflectivity. Weighs just 5.7 oz (Large size). $55.00 Suggested Retail, 50% OFF SALE $27.50… Quantities are limited, order soon!